As recently as March 2018, the discussion of neither political reforms nor economic liberalization was inconceivable in the Ethiopian political context. The changes both may have been an internal party decision particularly after EPRDF's 17 days dramatic deep renewal closed door meeting in Dec. 2017. However, there is no denying that the emergence of a reformist, young, and ambitious Prime Minster Abiy Ahmed has not just sparked unprecedented hopes and opened possibilities in the country, but also put these changes on autopilot. PM Abiy took over from Hailemariam Desalegn as Ethiopia's new prime minister after the latter's unexpected resignation in February 2018. Abiy Ahmed's election as a leader of the ruling party, did not occur uncontested within the party. In spite of the internal party fall out, however, the peaceful transition of power was a significant leap for the country with precarious past that nurtured division and animosity among its various ethnic groups for almost three decades. The new prime minister has made many promises and delivered on some within his first hundred days in office. Nonetheless, there are still high expectations from the general public on his commitments including to pave a way for transition to democracy and genuine multi-party system in Ethiopia. In hopes of fulfilling these efforts, the people of Ethiopia from all walks of life, including opposition parties, have overwhelmingly support the new PM's visions for the country and want him to succeed. Notably, he inherited a country that has seen some of the fastest economic growth in the world in recent years, but has also been riven by years of protests by the young and old alike, in Oromia, Amhara and several cities and towns in southern regional states; Ethiopians who live marginalized politically and economically. The issues facing the country are countless. For starter, the PM has a daunting task ahead of him of uniting a country that has been fragmented by years of protests, violation of human rights, economic disparity and corruption. The second, perhaps, the most challenging task, is that of reinventing the wheel of balanced economic development that boosts the full participation of citizens reinforced by good governance and administrative efficiencies. In all cases, he will be faced with immense resistance from people who have a vested interest in maintaining the status quo. In an effort to spur economic growth, the PM has floated his intention to privatize some of state owned institution in full or in part. There have been discussions as to how the country could set the stage for domestic and international investors to inject the much needed fund and foreign currency into the economy. This shift in direction is remarkable given the fact that controlling the market, presumably, has been the core principle of the elites within his party and the decision many not have been reached without sharp division within the party. First, it is important to understand why countries take the path of privatization. There are three main reasons that pressure countries to privatize - budgetary stress, the desire to foster competition, and/or a push from international 'donors'. In his June 19th, 2018 speech to the general public and business communities, the PM has stressed that the country is in dire need of foreign currency and he would do anything to create economic stability. This concession in public, by the Prime Minister, was seen as brave since there were no other previous leaders who have acknowledged government's near totally failure. It is not a secret that the country has a high budget deficit, high foreign debt, and is dependent on international agencies like the World Bank (WB)and the International Monetary Fund (IMF) for its annual budget planning. This suggests that the country is more likely to pursue privatization as a source of revenue. It seems rewarding as this would give it a breathing room in the short term considering the country's immediate need. It is generally understood that privatizing inefficient state run organizations would enable governments to raise funds that would be invested in social programs such as education and healthcare. However, the policy remains controversial and the relative roles of ownership and other structural changes in promoting economic efficiency remain uncertain. Some believe that what belongs to the public should remain with the public, while others argue that private enterprises are better situated to be run by private businesses, not government which has failed to run its mega companies in the first place. These companies, the argument goes, have (if run by private businesses) a potential to generate the revenue that is needed to support the ambitious economic growth and other social services. The evidence from other developing countries indicates that if privatization is to be effective over the longer term, it needs to be accompanied by policy instruments that stimulate competition and effective policy directives which need to be integrated into a broader process of structural reform. Privatization without a tested policy and legal framework, mature political and economic infrastructures, and a capacity to negotiate with multinationals would prove anything but efficient. A poorly designed privatization would, in the long-run, lead the country in the path of irreversible post-privatization predicament where monopolies and international corporations assert the economic upper hand. It is appealing for governments to privatize first and seek competition later as the expected revenue is higher than it would be in the case of adopting competition first and then privatizing. When a government entity is transferred to private ownership, the price the government receives reflects the future expected profits of the business by the private owners. If the government privatizes the business with minimal or no competition (monopoly), then the probable profits and price received by the government is high (high social cost). However, if the government sets up a competitive market beforehand, then the future expected profits from privatization is likely going to be lower and so is the payment received by the government (low social cost). Privatization doesn't just increase costs. It also leads to greater inequality, as user fees increase and operators reduce wages (even layoffs) and benefits for workers. For any type of public company, shifting the provision of ownership to the private sector is not a simple solution that fits all. According to Bank of Canada, government policy in the areas of privatization in Canada has generally been less rapid and extensive than other developed countries with comparable economy. For instance, in Canada, nationalized industries are deemed to be natural monopolies, such as the generation and distribution of electricity, or industries considered vital to the development of provincial and federal economies. To date, majority of Canadian utilities are owned by Federal government, Provincial governments or local Municipalities. However, due to fiscal constraints, increased concern about the efficiency of public ownership, changing conceptions of natural monopolies, and the availability of other options to meet public policy objectives, governments in Canada began to privatize their corporate holdings in the mid-1980s. Given the size of the Canadian economy, political stability and abundant natural resources, the slow process can be a successful model for any country evaluating privatization. The other aspect of such major undertaking is the national security concerns in certain industry. Especially, major corporations like Telecommunications and Electric Power are considered in the interest of a national security to remain under public holdings. These types of corporations are mostly maintained in full or in part under state or local government authorities. The concept of privatization has been controversial and among top debates in any political settings, even in the countries that have enjoyed the benefits of liberal market for many years. Before embarking on the idea of transferring government owned enterprises, the following steps would help mitigate the risk of running in to complex post-privatization challenges. As initial step, the government would need to liberalize the market (laissez faire) by eliminating state control over economic activities. This includes the pursuit of lower tax rates for businesses, less restriction on both domestic and foreign capital, less strict market regulations, eliminating privileges, removing unjustified tariffs, and subsidies. Such an approach would encourage, at least to some degree, home-grown businesses to flourish and be innovative. Establish an advisory council, with a clear mandate, that conducts case-by-case or sectoral studies to identify sectors that are inefficient and need to be privatized. This would include designing a phased approach as mass privatization is likely to lead to massive self-dealing. Study the possibility of introducing a hybrid privatization approach where there exists government and private ownership cooperation. This could be outsourcing the management part of the organization and maintaining the core business. 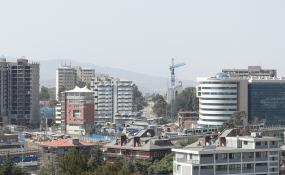 Set out parameters as to how foreign ownership can play a role in Ethiopian infrastructures - set a threshold for foreign takeovers and empower and provide tax incentives to local investors to participate and invest heavily in public infrastructures. Set out robust rules for privatized businesses and create institutions with the authority to implement privatization and build their capacity to monitor compliance with these rules. This would include establishing a competition bureau in order to prevent the potential cartel effects of purchase of state enterprises by domestic or foreign entities with market power. Hussien Berisso holds a Master's and Bachelor's degree in Engineering from Ryerson University. Hussien has previously worked for Manitoba Hydro, government owned electric power utility, and currently works as an independent contractor with ASA Energy Consulting LTD with a focus on renewable energy. Should Uganda Transform Makerere Into a Private University? Will Nigerian Govt Sell Public Health Institutions? Is Privatizing Water the Solution?